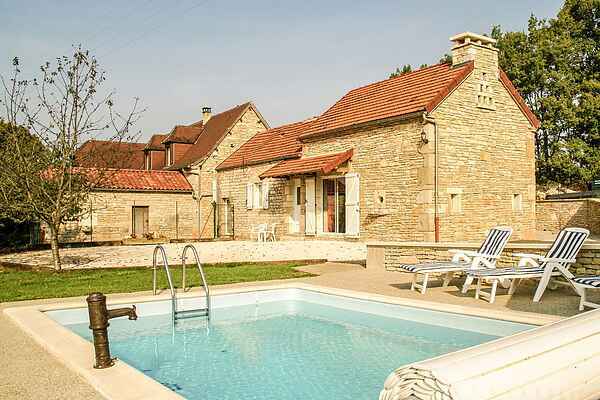 This natural stone house, that was renovated and restored in 2008, is situated in a pleasant location near the village of Cressensac. You have your own private pool and an entirely enclosed garden facing south, it has a lawn, climbing frame for the kids, gravelled area with garden furniture and pétanque balls, a badminton set and a barbecue. All ingredients for a pleasant evening. On the covered terrace, you can start reading a new book. Indoors, the interior is particularly complete and well-kept. You'll feel at home in no time! From you holiday home you can walk towards the centre of Cressensac. Here you can find a nice restaurant, buy your groceries or go to the bank or weekly Sunday market. You are located in the Lot, which means you are only a short distance away from a many wonderful places of interest. Visit famous Rocamadour, the caves of Padirac and monumental Château de Castelnau for example. You are close to the department Corrèze. Also challenge yourself to a canoe trip along the Dordogne river. Afterwards you can go to the renowned Souillac (17 km) for a bite and a drink.